Special bar and chain makes quick sharpening in the field a reality. Blount International has taken one of the biggest frustrations of wood cutting off the table with its expanded line of PowerSharp on-the-saw sharpening equipment. 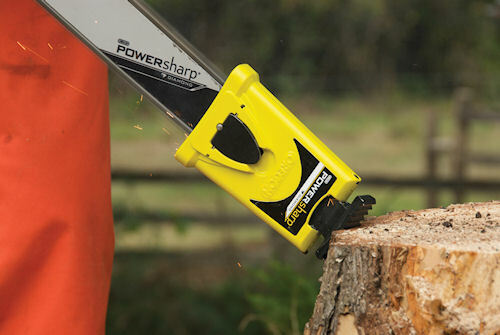 Sold under the Oregon brand, PowerSharp kits are now available for nearly every chainsaw on the market and for most of the saws already in use. The portable, easy-to-use system includes a PowerSharp top-sharpening chain, a bar-mount sharpener, and a special guide bar. Together the components provide a fast, simple method for sharpening a dulled chain within 3- to 5-seconds in the field. Three- to five-seconds to sharpen a chainsaw? That could be quite handy this fall stoking the fireplace. Blount's on-the-saw sharpening system has been expanded to fit most saws on the market and in use. The PowerSharp starter kit, which includes all of the needed components, sells for around $75, and replacement chain and sharpener stone kits for the system retail for under $40. The bar-mounted sharpener and guide bar, also packed together, sell at around $40. The system is available through many home improvement and hardware stores, along with chainsaw service stores. For more information click on www.powersharp.com. By "clicking" here, you've indicated an interest in the latest in agricultural technology, and we'd like to provide you with even more of What's New in the power-tech industry. To receive our bi-weekly e-newsletter on trends and developments in machinery and ag technology click here POWERIRON to join thousands of readers who receive our updates free of charge every other week. For Willie Vogt's observations about the growth of technology in our industry, be sure to visit his FARMER IRON column. In addition, if you have interest in livestock technology be sure to visit www.beefproducer.com for news and views and new products related to beef cattle and the beef industry.